Our service is available twenty four hours a day, seven days a week. To further enhance the service we offer, we have, over the past thirty years, become associated with three other leading Dublin Funeral Directors – Kirwans, Nichols and Carnegies. Collectively, we offer ten funeral homes and offices located throughout Dublin City and County, all managed to the highest professional standards. Our service is available twenty four hours a day, seven days a week, with every call answered personally, irrespective of the time. No answering machine – instead, a person-to-person telephone conversation is guaranteed at all times. 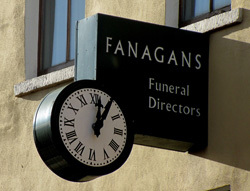 "The person at Fanagans actually pointed out a number of unnecessary things we had been considering and helped us to reduce costs substantially"
Assistance is provided regardless of financial restrictions and funerals can always be arranged to meet a specific budget. We can advise on how to reduce costs while always being mindful that quality and dignity are essential pre-requisites. We are there for you at all times, day or night, to provide excellence in Funeral Care when you and your family need it most.